I was talking with a real estate agent the few days ago, helping her plan her social media strategy. She had set up a page on Facebook for her business and set up a Twitter account as well. While she wasn’t super active – posting maybe once or twice per month – she was making an attempt to market off the huge networking opportunities on social media. But she was discouraged about why she wasn’t getting more likes, followers and engagement on both Twitter and Facebook. The main reason? While she had created the accounts (which to her credit is more than many real estate agents do), she did absolutely nothing to promote either of them, and this is a huge mistake many social media novices make. In order to get followers, likes and conversation on either Twitter or Facebook, you need to ensure you are promoting your social media accounts so people can find them. The vast majority of your potential clients aren’t going to hunt down your Twitter account, but if they see a link to your account, chances are they might click it and then follow you. So what are things you can do in order to promote your social media accounts so people realize you have them? This is one of the most cost effective ways to repeatedly get your social media accounts before your clients. At the end of your regular email signature, add “Follow me on Twitter at @yourhandle” and “Like us on Facebook!”. And be sure that signature is linked to both of those accounts – you want people to just click and end up on your Twitter account. If you make them type in www.twitter.com/yourhandle, chances are good they won’t bother. Always remember the KISS method. Make sure you add your relevant social media links to your website. Facebook and Twitter are the most common, but also add your YouTube account and Pinterest account if you are utilizing them as part of your social media marketing campaign too. If you have a webmaster who makes your changes for you, send him or her the links to your social media accounts so he can add them along with the appropriate company logos – this is one of the more common website additions so it should be quick and easy to add to your website. Especially if you are taking out a larger sized ad, it is easy to add “Follow me on Twitter at @yourhandle” and “Like us on Facebook!” on those print advertisements. Or if space is limited, choose one or the other. And if you do happen to have a large advertisement coming out, don’t forget to make sure you update your Twitter status or share something on Facebook. You don’t want people to see you have a Twitter account, only to discover you haven’t engaged on it for the past six months. While on Pinterest it isn’t as obvious if you haven’t shared anything in the past six months, on social media sites such as Twitter and Facebook, it is quite noticeable. People also forget that posting on those accounts is also promoting those accounts. Anytime a client shares something you posted on Facebook, it has the added bonus that all that client’s friends and family see not only the share, but also that it originated with you, and those people are not only reminded of your name, company and what you do for a living, they might also re-share it to all of their friends too, extending your reach on Facebook even more, and potentially getting not only brand awareness for yourself with a potential new circle of people, but also the possibility that some of them will “Like” your Facebook page as well. While it would be amazing to just be able to create our social media accounts and then ignore them, while the magical powers of social media do the rest, in order to make social media work, you do need to put some effort into promoting it. Note: We offer social media audits and strategy blueprints for realtors looking to extend their social media marketing for networking and selling. Please contact us for more information. Using short URLs can seem like a quick and easy way to send someone to a page on a website that has a superlong URL. It has gained lots of popularity over the last couple of years, but there has started to be a backlash from that users when they see those short URLs. Why is this? Will you can blame the spammers for that. People don’t trust short URLs anymore because they can’t see the destination page though be landing on. You might be sending them to realsimple.com or marthastewartliving.com but you could just as easily be sending them to spamcity.com because they just don’t know. People do like using short URLs because they can track how many people are clicking on it, but a lot of people are finding that they can actually get more clicks and engagement when using the true URL. It’s not such a big problem on Facebook because when you share a page on Facebook it does show the destination URL and there’s no real point to using a short URL instead. But on Twitter, when you only have 140 characters, it’s more common to see people using the short URLs there. The good news is that Twitter can automatically shorten links for you, using their t.co link shortening service, and when it the tweet is viewed individually, it will show the full URL and the snippet from the page it is linking to. Still insistent that you need a URL shortener to track clicks? Some companies are using their own personal URL shortener. They register a very short version of the URL, and install one of the many scripts out there that will shorten links and provide stats for doing so. However, even this is become less popular in the last year or so because of the whole trust issue. If you are a large company, you can do it, but if you are a very small company that many people don’t know, it’s not as easy to earn that trust – or just the people you recognize that that shorten URL service actually belongs to you. And if you still want to use a third-party URL shortener service, the two most popular shorteners are Google’s goo.gl service and bit.ly. Both provide analytical data including how many people clicked the link you shared. Do be aware that if the page is popular and has been shortened by others, it will show data for everyone who has shortened and shared, not just you. 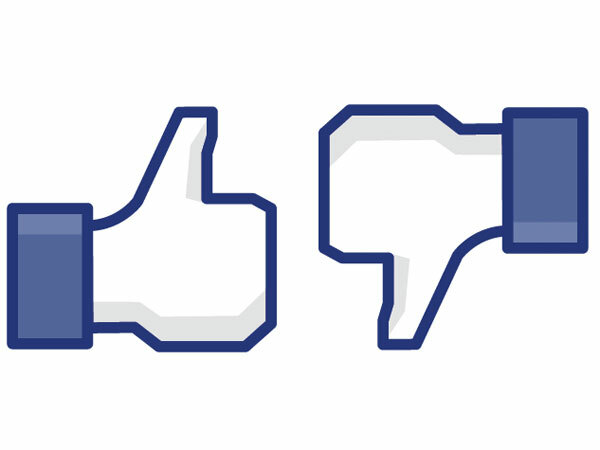 If you have spent any time on Facebook, you’ll know that your friends are constantly recommending you to “like” stuff on Facebook and often you click like without thinking about it. Or maybe you are on a website and you want to enter one of their contests, and to enter, you simply need to like them on Facebook. And there are also nefarious websites that will use underhanded tricks to cause you to like their page, disguised underneath something else you click, so even though it may not seem like you’ve actually clicked to like them, and actually registers of the like on Facebook, and it will show up on your timeline for anyone to see. When you’re looking at someone’s Facebook page, Facebook makes it pretty obvious what things they have liked. And I’m sure there been times where you have questioned when you have seen that someone likes something that either think is completely strange or worse, is an organization or company do not agree with. Now look at it from the perspective of someone you want to impress, such as a potential home buyer or seller. They are going to scrutinize your likes as well, to get a sense of the kind of person you are, especially if you have been recommended that by someone or the as seen an advertisement. What is on a Facebook page truly says a lot about the type of person someone is. But the downside is your Facebook page might be saying something about you that you are intending to. When you got to Facebook comment you see your new stream, that is all the activity to other people are doing. But you often aren’t looking at your own personal page to see what is coming across on that page, such as things you have liked or articles you have shared. And this is where a lot of people get caught, because something show up they never intended to. And the biggest culprit tends to be pages that people have “liked”. Fortunately, it is quite easy to look at your legs, and to clean up and to lease any lakes that don’t represent the the impression you want to give people. Here’s how you can go to your likes to remove any you don’t want, and I think about the impression you are giving off to people with them. First, what you should do is go and evaluate everything you have liked up to this date. Simply look on your Facebook page, and click on your likes to see everything you have liked so far. If there’s anything that could come across as being slightly controversial or that some people might not share your passion for, just click on like rather than it coming back and haunting you later. Now, you might have liked Hooters because you love their food. But think of it from the perspective a potential female home buyer or seller, it is going to give them a very likely negative impression of you, before you even meet them. And first impressions are everything. Likewise, things that proclaim you pro-choice or pro-life should probably stay off your page, as should any political affiliations, unless perhaps you live in an area that is primarily supporting one political party, but then you still need to take into account that you could lose potential clients who don’t support that candidate or party. The bottom line is you want to make sure that your Facebook page represents not only you personally, but the person you want people to see when they are looking at you objectively as a potential realtor. This doesn’t mean you have to hide the person you are, but just consider whether you really need to let people know that you’re a fan of Hooters or a trashy reality show. 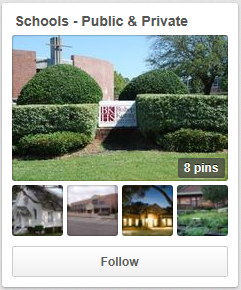 So often I see real estate agent to have gone to the effort of setting up a Pinterest page, but all they are doing is simply pinning their listing images, the very same images they have from their MLS listings. But in order to really market on Pinterst, you may think about what is of interest to people in your community, not just using it as a platform to post pictures of houses you’re selling. Here is one really useful way you can use Pinterest to leverage more traffic, more followers, and more re-pins. 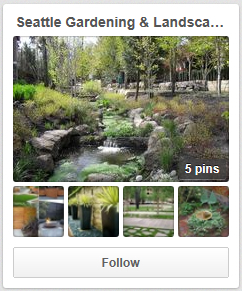 First create multiple community related boards on your Pinterest page. Now, this doesn’t just mean pinning local schools and local libraries. It means really going beyond what many real estate agents have on their websites regarding the community, and creating boards that are of interest and use to potential homebuyers. 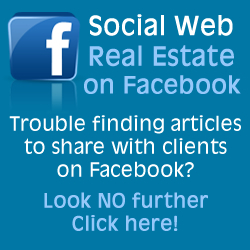 These kind of community boards articles useful and interesting to people who may not necessarily be looking to buy a house now, but perhaps their friends are, and they has seen one of your followers re-pin something you originally posted. 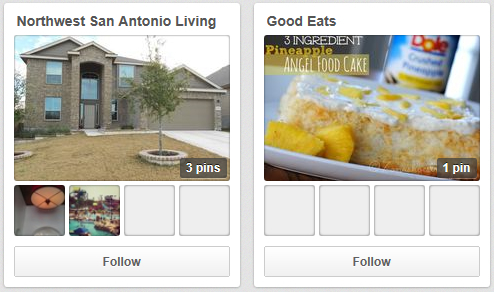 Pinterest is very social, so you never know who might share your pins and boards with you. And every time you get your name out there, you are continuing to build your personal brand in your community. Here are some ideas for the different types of community boards you can create and pin images to in order to promote your community to both homebuyers and future homebuyers their friends with. Pin images of the maps that show where the different neighborhoods, and communities are in your particular real estate market. Then also include pictures of iconic landmarks or features in each of those neighborhoods. Make sure you include comments on the photos that details exactly what neighborhood each of the photos is taken from. 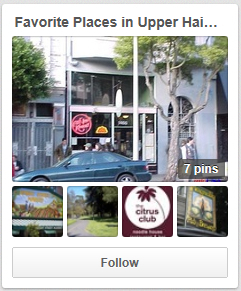 Here is the “Favorite Places in Upper Haight” board by the Climb Real Estate Group in San Francisco. Pin posters of upcoming events, and photos of events that happened local to your area. This could include things like festivals, parades, charity walks and runs, any kind of event that bring a real sense of community to your marketing area. If you aren’t aware of events that are happening, check out your local Chamber of Commerce or city/town website, or ask for recommendations from friends and family on Facebook and Twitter. Do you have some great museums, water parks, sporting arenas, concert halls, gardens, hiking trails, regular farmers market and the like? Post pictures of each of these kinds of things so that particularly if potential buyers are moving to the area they can get an idea of some of the things they can do. Don’t forget to include things for kids as well. Create a board that has some of the local art galleries, art museums, local artists and photos from any art shows you may have attended. The art scene can be a real draw to some homebuyers, so showcasing this can be a great way to introduce people who are new to the area to your local art scene. Link to local schools in your area, including both public and private schools, co-ops, specialty education schools and more. Be sure to include any special programs a school is known for (ie. “Best football team in the state” or “The award winning Honor Band program is great for musically inclined students”. The Lisa Barton Team at Pridential Realty created this “Schools – Public & Private” board featuring the schools in her Florida market area. Does your area have some great outlet malls? Or a street that has all the designer stores? Or even some other great shopping destinations, such as traditional malls or a particular area that caters to local businesses. What about antique stores? Or an area with local galleries? These are all things that can get people interested and excited about your community. Pin some of your favorite restaurants you like to go to in town. Be sure not to just pin the upscale places, focus on some of the unique local restaurants of all price ranges, including things from family restaurants to swanky wine bars. Once again, be sure to include a sentence or two about each restaurants, such as “this place has the best pizza” or “best happy hour in town”. Don’t always go for the traditional photos of restaurants, taking the photos of the restaurants in the evening, or the sidewalk board they use. Are there some great public landscapes or gardens? Unique local nurseries that cater to organic gardeners? Great local landscapers? Highlight some of them. Do be sure to always pin at LEAST 5 images to a board, that way when people search for a board, it isn’t obvious that it is mostly empty, as Pinterest shows 5 pins on each board preview page. This nameless realtor got off to a good start, planning her boards, but never continued after the initial “let’s pin some stuff” day. When those are the only two boards on that realtor’s Pinterest page, and both of her boards are mostly empty, it doesn’t look professional. She also missed potential marketing as some of her pins were re-pinned as well.